[ATTENTION] Fanup in Aeria Games National Tourney! Attention FanUp throws in some Nationals prizes! As many of you know once a year we have a National Tournament where we have competitive teams from North America and Europe compete in a 32 team bracket to determine who will represent USF @ SFWC against the international teams from all over the world. The team that emerges as the victor of the NCGPX will be sent to SFWC by Aeria Games to compete against the top teams from each version of SF around the world! SFWC is the Special Force World Championship. This event is a LAN party in which the best teams from every other version of SF compete for the title of WORLD CHAMPIONS! SFWC is expected to take place during December. The location and confirmed date will be revealed at a later date. Now you guys may be wondering, what exactly are Fan Bucks? 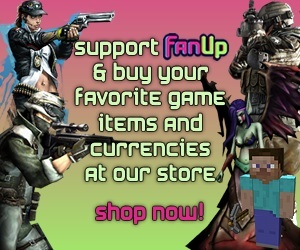 Fanbucks are fanups currency for buying their game marketplace items, its basically like Playspan use to be regarding their ultimate points marketplace. You guys can use these to redeem them for a lot of free to play games on the market right now. Ranging from mouses to headsets. This will be the first tournament hosted by us that involves gaming gear as prizes! Gaminggearz will provide gaming gear prizes for SF events as well as doing reviews for certain gaming gear products. I would like to thank GGZ for helping sponsor the 2013 NCGPX so check them out! they will be able to give out more gaming gear prizes for USF. Aeria Games will also provide ingame prizes such as armor, loads of SP,ingame items and PERM weapons of choices to the players in the top three teams. More detailed information on the prizes of GGZ and Aeria Games will be posted as the NCGPX begins. The qualification period will take place during the duration of these dates. Nationals will require for teams to qualify to secure their spot in the brackets. This is to ensure that actual competitive teams are able to play in the brackets. Please follow the instructions here to get yourself setup with the GAC. PICTURE OF PASSPORT showing the name, birth date, expiration date, and photo identification. team must submit the following information in the following format to..